This Suet Crust Pastry may be used for both sweet and savoury dishes. Unlike other patries, which are usually baked, suet crust may be boiled or steamed. It also differs from other pastries in that it always contains a raising agent: whn plain flour is used, baking powder is added in the proportion of 4 level teaspoons to each 1 lb of flour. Self-raising flour may also be used with satisfactory results, and in this case an additional raising agent is not required. In certain recipes, in which breadcrumbs are used to replace some of the flour, the proportion of baking powder used with plain flour is reduced. 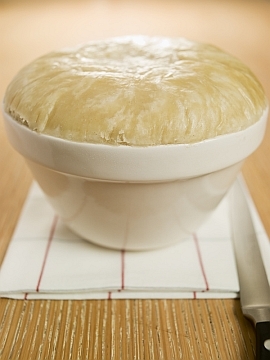 This Suet Crust Pastry is a perfect solution when making dishes like a Steak and Kidney Pudding, or a Fruit Pudding - sweet or savoury, it doesn't matter - this pastry is flexible. To prepare block suet, remove any skin, sprinkle the suet with a little of the flour and shred or chop it finely. Sieve flour, baking powder and salt together and add the suet. If breadcrubs are used, add them at this point. Mix with cold water to a soft, not sticky, dough. Knead lightly, then turn it on to a lightly floured board and roll out as required.